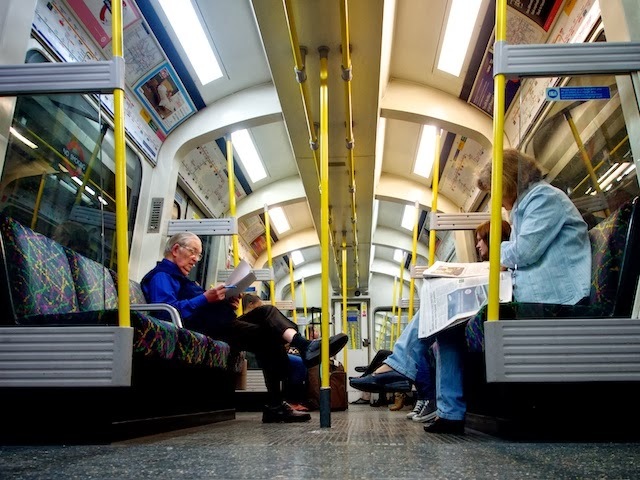 When in London, we choose to travel on the Tube, the London Underground as it is also known, yet our "first day in London" post to this blog always seems to feature a red bus or a black cab as some sort of evidence that we are here. Today, with the possibility that this will be our last visit to the City for some time looming, it seemed appropriate to pay some sort of minor homage to our favourite mode of transport. It was just luck that with camera in hand, we found ourselves on a line with a newish train operating at a time when the usual crowd was not around, and probably the time we were travelling does not really reflect the true emotion of the crowd, nor for that matter the crowding of the crowd, but if one closes ones eyes and imagines say two thousand people in this picture, one could gain a reasonable impression of what peak hours are like. One perhaps curious fact about the tube, is that the hand-holds in the carriages are coloured to match the colour of the line on the tube maps, so one with a map in hand could see at a glance that we were travelling on the Circle Line when this photograph was taken. At the time we going round in circles a bit ourselves on our way to find a propellor repair company that we could entrust to carry out a few little adjustments over winter. Propellor repairing is not something that one's mind immediately associates with London. We've never actually seen a picture of a bowler hatted banker standing beside a London Bobby with their arms around a propellor repair man, but today we found our man, who it turns out has been repairing propellors since 1958, and who politely chuckled when I told him I'd been breaking them since about then. He would, he said wait breathlessly for the next few months until we could get our propellor to him. We, reassured by his undoubted experience, wandered off into the London sunset, Tube Map in hand.